There are numerous amazing swimming holes around the world. Some of them are extremely popular, while others fly under the radar. With flowing waterfalls, turquoise waters, and gorgeous sandstone cliffs, here are some of the best secret swimming holes you will find in North America, Asia, Europe, and Australia. 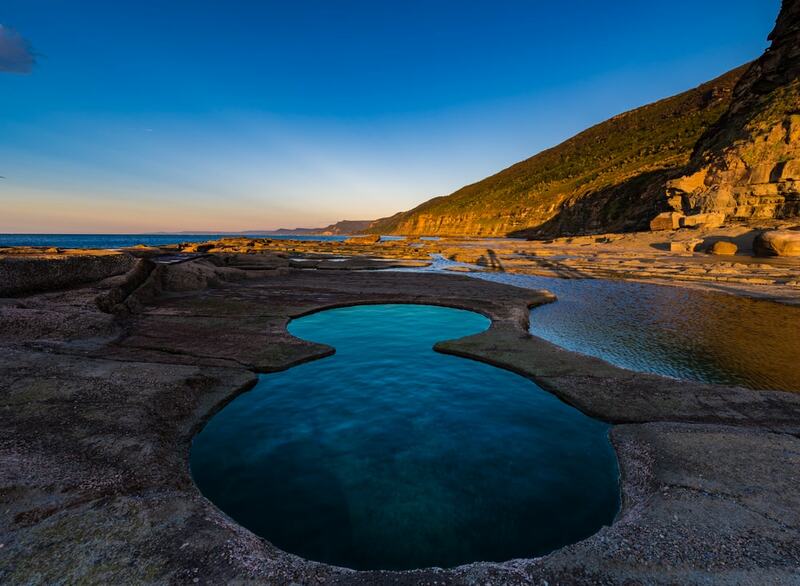 The Figure 8 Pool lies near Burning Palms Beach in Royal National Park, about an hour outside of Sydney. There are many natural rock pools around this area, and one just happens to be perfectly shaped like a figure eight. It’s a difficult, slippery, rocky, and steep three- to four-hour walk to reach the swimming hole. NSW National Parks advises people to only visit at low tide when the waves are small. God’s Bath is a secret swimming hole that sits about an hour’s drive from Tuolumne in Northern California. AllTrails has some information about the path that goes to God’s Bath. It’s a 0.9-mile (1.45-kilometer) trek to reach the swimming hole, which features towering boulders, waterfalls, and deep pools. Visitors say it’s a popular place with cliff jumpers. 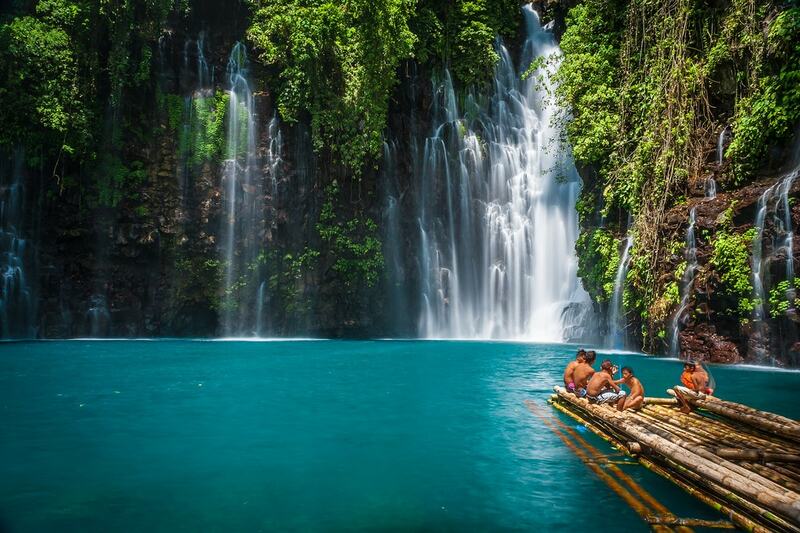 Tinago Falls lies on the Agus River just outside of Iligan City on the southern Philippine island of Mindanao. The waterfall plunges 73 meters (240 feet) over the cliff into a beautiful turquoise-colored swimming hole. There’s a small cave under the waterfall, where people can stand and listen to the thunderous water. Tinago Falls is definitely an off-the-beaten-path natural wonder. Translated to the Two Eyes Cenote, visitors will find Cenote Dos Ojos near Tulum in Mexico. Many say it’s one of the best diving spots on the Yucatan Peninsula, and it has one of the world’s largest underwater cave systems. The swimming hole has excellent visibility and maintains a temperature between 24 and 25°C (75 to 77°F) throughout the year. It does cost 200 pesos to enter, and snorkeling equipment is available for hire. Texada Island itself is a hidden gem in British Columbia. It’s the largest of the Gulf Islands, and it is known as the jewel of the Georgia Strait. On the island, visitors will find the incredible Heisholt Lake. It’s a former limestone quarry, which is now an azure-blue freshwater swimming hole. Its water is quite warmer compared to the cool BC seawater. Its location is a short drive from the ferry terminal at Blubber Bay. Dragonara Cave is also known as Coral Cave and Coral Lagoon. 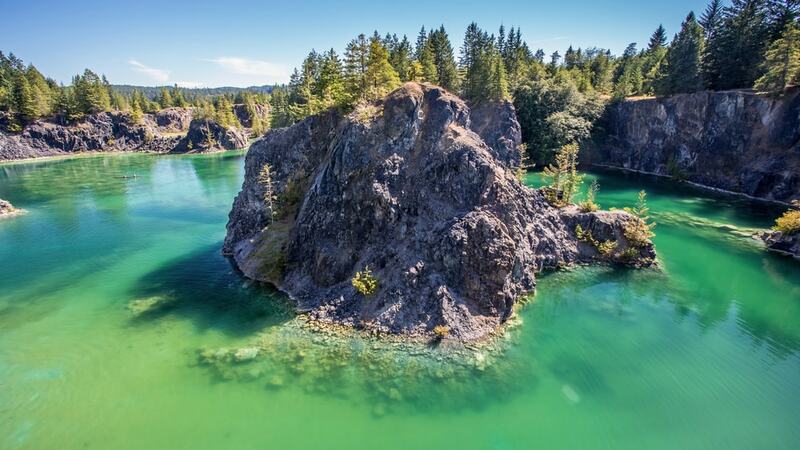 It’s a deep swimming hole that people can jump into from its surrounding rocky cliffs. Located in Mellieha on the northernmost part of mainland Malta, it’s quite secret as there’s no way to reach it via public transit. Go swimming, snorkeling, or enjoy watching the sunset from Dragonara Cave. 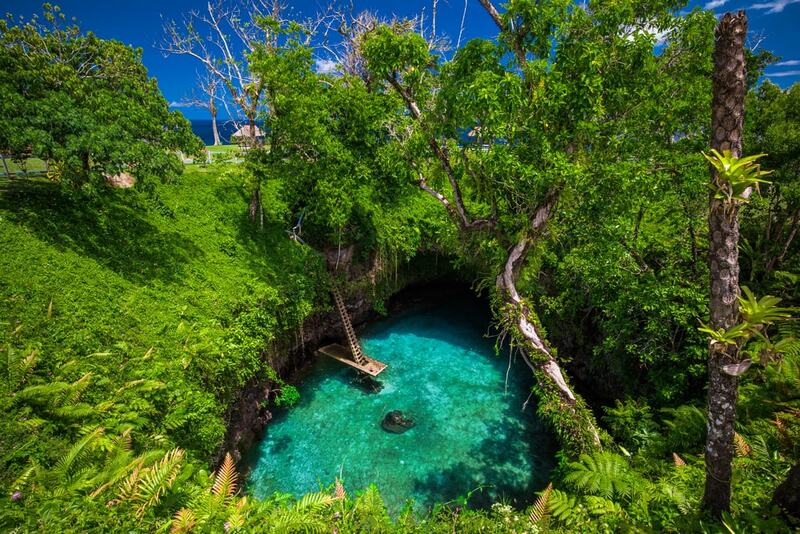 Visitors will locate the To Sua Ocean Trench, situated in Samoa, on the island’s Main South Coast Road. The stunning attraction features “a unique land formation consisting of two giant holes joined via an ancient lava tube cave.” One of these holes is To Sua Ocean Trench, a 30-meter-deep (98.4 feet) swimming hole that features turquoise waters, lush greenery surrounds, and access via a ladder. Gunlom Plunge Pool is a crystal-clear natural plunge pool located on Waterfall Creek. The swimming hole’s best feature might just be its incredible view overlooking the UNESCO World Heritage Site of Kakadu National Park. There’s a seasonal waterfall at Gunlom Plunge Pool, as well as a shaded picnic area and a nearby campground. Part of the Grand Canyon National Park, Havasu Falls sits within the Havasupai Indian Reserve. 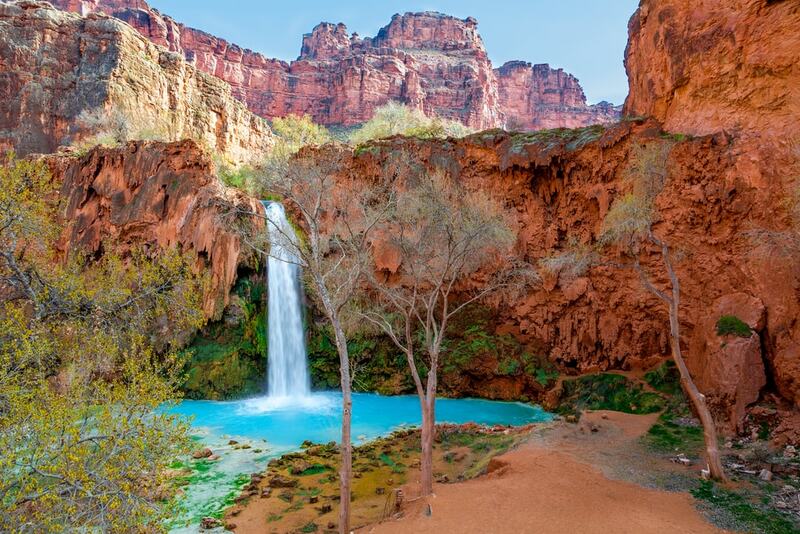 Havasupai translates to “people of the blue-green waters,” which is a very accurate name when you see the amazing color of this secret swimming hole. However, it’s 16 kilometers (10 miles) each way to reach Havasu Falls, so be prepared for a long hike to see this masterpiece with your own eyes. Berekhat Zefira is the definition of a top secret swimming hole. Located south of the Dead Sea in Israel’s Northern Negev region, there are many hidden pools and swimming holes within the canyons northwest of Masada. The Travel Channel suggests hiring an experienced local guide and being prepared to hike to these secluded spots. 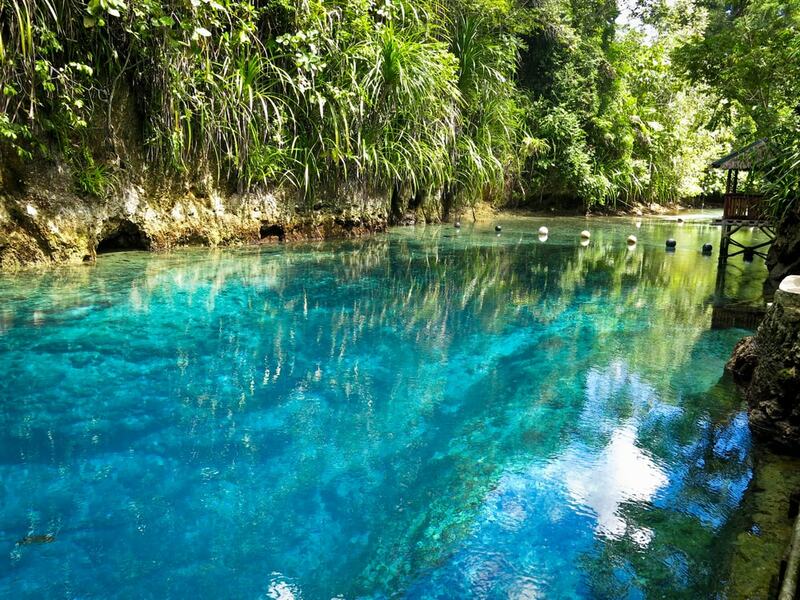 An unnaturally clear saltwater river on the island of Mindanao in the Philippines, Hinatuan Enchanted River is known for its ethereal blue and turquoise water. It’s called a river, but it only stretches for 270 meters (885 ft) and is 24 meters (80 ft) deep. Hidden in the Philippines jungle, the Hinatuan Enchanted River flows into the Pacific Ocean. No one knows where the salt water comes from, but one theory involves an underground cave system. Approximately 12 kilometers (7.4 miles) northwest of Jacmel in Haiti is Bassin-Bleu, one of the best swimming holes in the country. It includes three blue pools (Bassin Clair, Bassin Bleu, and Bassin Palmiste) linked by waterfalls. Some visitors say Bassin Clair is the most beautiful swimming hole, thanks to its sheltered position. Local tour companies in Jacmel can help you reach Bassin-Bleu, but be prepared to climb and rappel down rocks. 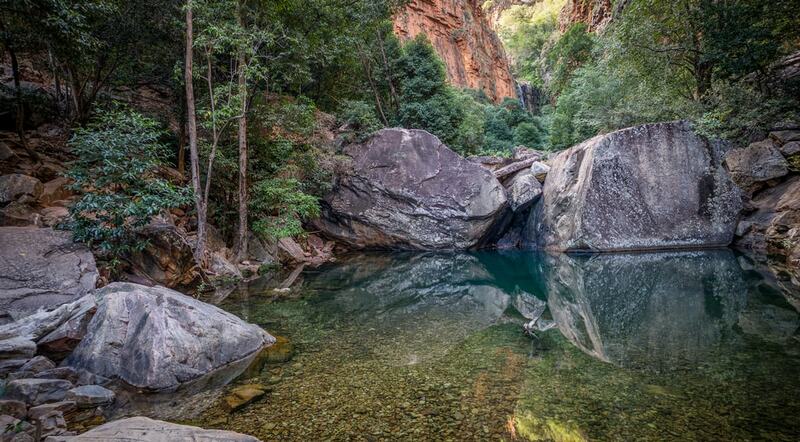 Emma Gorge Waterfall, located within El Questro Wilderness Park in northern Western Australia, is about an hour’s rocky walk from Emma Gorge Resort. At the end of the journey, you’re rewarded with a 65-meter (213-foot) waterfall, and a clear swimming hole surrounded by rocky red cliffs. Emma Gorge Waterfall is only open from April until October, as it closes for the wet season. Known locally as just The Crater, Homestead Crater is the only warm scuba diving destination in continental America. It’s a geothermal spring hidden inside limestone rock, located on Homestead Resort’s property in Utah. Although it’s a 16-meter (55-foot) dome with a hole in the top, the resort created a tunnel to gain access to the swimming hole, which includes a small deck at the end. Visitors can soak in the mineral water, swim, scuba dive, snorkel, or even join a paddleboard yoga class. Its temperature ranges from 32 to 35°C (90 to 96°F) year-round. 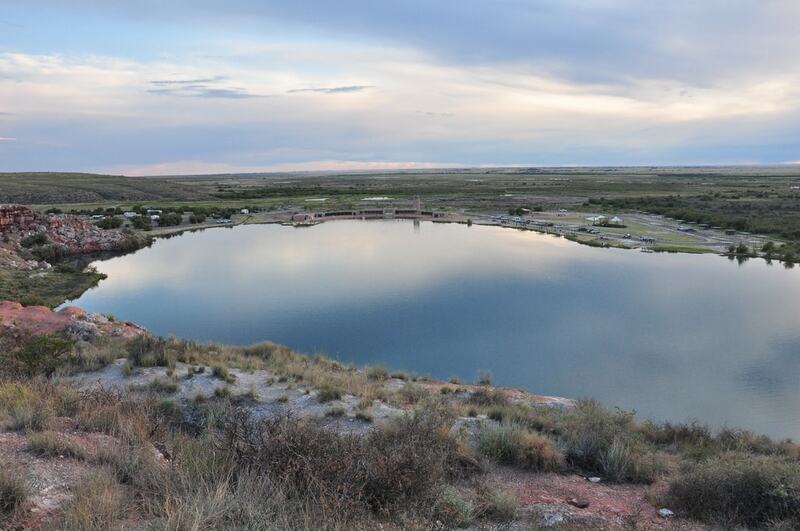 New Mexico State Parks says Bottomless Lakes State Park is your place for bottomless fun. The park lies 22 kilometers (14 miles) southeast of Roswell. Its swimming holes are actually sinkholes that range from five to 27 meters (17 to 90 ft) deep. There are nine pools in total at Bottomless Lakes State Park, but Lea Lake is the only one where swimming is allowed. It has a sandy shoreline on one side, and rocky cliffs on the other. Turpins Falls in rural Victoria is a swimming hole and waterfall that’s larger than an Olympic-sized swimming pool. Rock walls surround it on three sides, and it used to be a popular cliff jumping destination. However, Parks Victoria has now prohibited this practice after a spate of injuries and fatalities, caused by the low visibility in the water, which is also very cold year-round—bring a wetsuit! Located 45 kilometers (28 miles) from Reykjavik, Reykjadalur is one of Iceland’s largest geothermal areas. Translated, it means “Steam Valley,” which is exactly right! The official hot spring swimming hole, formed from an extinct volcano, is about a 45-minute to one-hour walk from the carpark. Fortunately, the walk is incredibly photogenic and includes waterfalls, boreholes, and many springs.